The Greek agora of Athens was located northwest of the acropolis and has been extensively investigated. 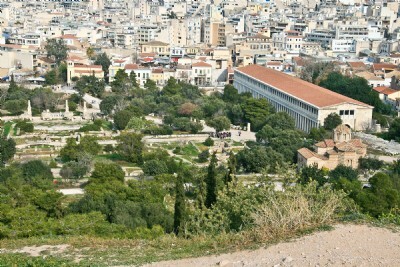 We are just beginning to post images of the ancient agora in Athens. Additional commentary and images will be forthcoming. This is the “market place” (Greek agora) mentioned in Acts 17:17 where the apostle Paul would “reason” with those present on a daily basis. The “Areopagus” is located at the southern end of the agora. To visit the "birth place of democracy" Click Here. For helpful descriptions of Athens from the perspective of the New Testament please see John McRay, Archaeology and the New Testament. Grand Rapids, MI: Baker, 1991, pp. 298–310 and John McRay, Paul — His Life and Teaching. Grand Rapids, MI: Baker, 2003, pp. 156-64. Click on titles to view for purchase from amazon.com.